Contact us to start your ePrint Trial! You're invited to try the newest version of ePrint free for 30 days. CDP ePrint lets you say goodbye to preprinted documents and hello to secure, on-demand, customized printing of forms and other documents. 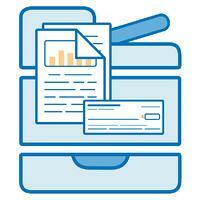 Hundreds of credit unions and banks have already made the switch to ePrint. Our newest update has made the platform even better. We're so confident we'll love ePrint that we're offering a free, 30-day trial. To get started, just fill out your contact information. One of our ePrint specialists will contact you within 24 hours to schedule your consultation and start the trial process. Want to know more about ePrint? Works with any type of printer. And everything can be printed in color or black and white. Offers user-driven customization. You can design and update your forms entirely by yourself. Provides scalable, per-printer pricing. You’ll only pay $55 to $75 per month for each printer. Increases your print and reprint logging. You’ll notice immediately superior management and convenience. And includes a free 30-day trial. We invite you to witness the positive implications of ePrint for yourself—without spending a penny the first month. Just fill out the form above to contact us. We'll reach out to schedule time to talk about our new web-based platform, schedule a demo, and start the process of getting your institution ready for the free, 30-day trial.